Demand Response Management System Market Size, Growth - Segmented by System Type (Conventional Demand Response, Automated Demand Response), and Geography (Asia-Pacific, North America, Europe etc.) - Growth, Trends, and Forecast (2019 - 2024). Demand Response Management System (DRMS) caters to problems such as peak loading, electricity blackouts, and expensive electricity buyouts by utilities, and offers cost benefits and incentives to the end-users linked to the DRMS system. According to World Energy Council (WEC), the global demand for electricity is expected to double by 2060 from the present level. This is primarily due to rising urbanization and industrialization, primarily in developing nations, such as Asia and Africa. As a result, with growing demand for electricity, requirement for implementation of DRMS is expected to rise to a significant level across the globe during the forecast period 2018-2023. Companies such as ABB, Siemens, Honeywell, and AutoGrid are few of the significant players who are actively involved in the promotion of DRMS across the globe. However, with the expected increase in the demand for smart energy usage and R&D investments, other players are also expected to come up with more advanced DRMS techniques and increase their market share during the forecast period. The high initial investment required for implementation of Demand Response Management System is going to be a critical factor in determining the growth of DRMS market, while factors such as the development of alternative and cleaner energy resources are expected to hinder the market growth. Demand Response Management Systems are the most capital-efficient and carbon-neutral way to strengthen the power grid, which helps to overcome the peak loads. In order to respond to the high peak demand, utilities build very capital-intensive power plants and lines. Peak demand happens just a few times a year, so those assets run at a mere fraction of their capacity. However, the end-users need to pay for this idle capacity through the prices they pay for electricity. Hence, the demand response is a way for utilities, not only to reduce the need for large capital expenditures, but also to reduce the per unit consumption rates. Moreover, with the increasing roll-out of smart grids and growing application of Advanced Metering Infrastructure (AMI) meters, utilities get real-time usage data of customers, which has led to increasing participation of consumers in the demand response programs over the past few years. 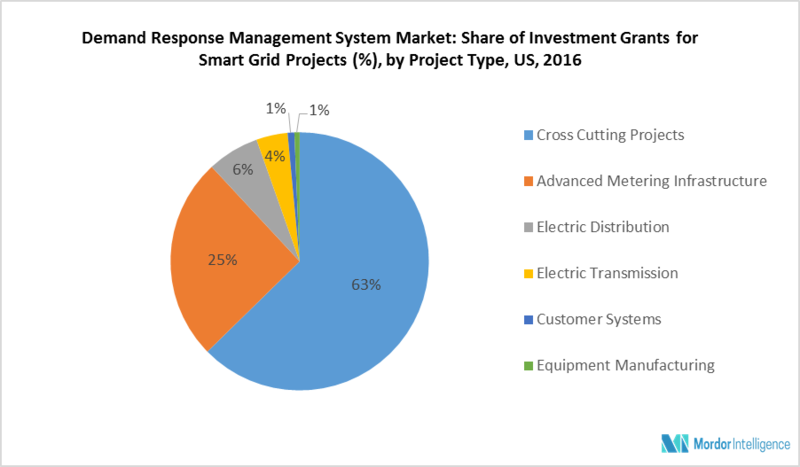 As a result, the rising integration of smart grid is expected to propel the growth of the demand response management system market during the forecast period. India is expected to become the largest potential for smart grid deployment, with smart grid infrastructure investments projected to reach USD 44.9 billion during 2017-2027, according to EAI. As a result, India is expected to witness enormous growth in the demand response management system market during the forecast period. In order to shorten their demand-side management and energy efficiency project timelines, governments across various nations are implementing demand-side response management technologies. Additionally, the increasing regulatory support from various governments in developing and implementing the green solution along with the smart grid solutions, have further increased the role of DRMS in the Asia-Pacific region. With the rising trend of smart energy consumption, countries in the Asia-Pacific region such as China, Japan, and India have attracted significant investments, which has created a huge potential for the demand response management system market during the forecast period. The United States has a vast electricity network, and therefore, deploying the demand response systems in this country would prove more profitable than in any other country in the world. In addition, the US energy sector has witnessed an increase in smart grid investments under the Smart Grid Investment Grant (SGIG) program. This program aims to improve the development and adoption of smart grid technologies and infrastructure. This initiative is expected to enhance the interoperability of electric vehicles and grid networks, which presents an optimum opportunity for the OEMs companies in enhancing the efficiency of the vehicles' batteries and other similar associated equipment related to DRMS. Hence, with the increasing adoptation of smart grids, the demand response management system market is expected to witness significant growth during the forecast period.